The question that we are aske the most often is. Where do the trees go when they leave my property? How much is my tree worth? These are very good questions. Another popular question that we get is. How does Arbormax offer such low rates? The answer to these questions go hand in hand. We try to use 100% of the byproduct that is generated from our jobs. This additional income allows us to offer our services at a lower rate than some of our competitors. We utilize larger machines that assist in processing the product. These larger machines also speed up the debris removal process. So where do the trees go? Here are some popular destinations and uses. A large majority of our wood is transported to wood yards who pay us for the wood in log form. These companies are middle men in the timber procurement industry. After they intake our logs, they will grade and sort them according to size, species and quality. They will then place these logs on a truck and take them to a lumber mill or chip mill and sell them for slightly more than they paid us. How much do we get paid from the wood yard for our logs? That is a very tricky question and not easy to explain. But we will give it our best shot. All payments to us from wood yards are based on grade and weight. Which means they will take the logs off of our truck, inspect them for defects and quality and then weigh them. Different grades of log and different species bring different prices. The better the grade (quality), the more money it will bring. There are usually three grades of logs. They are as follows. 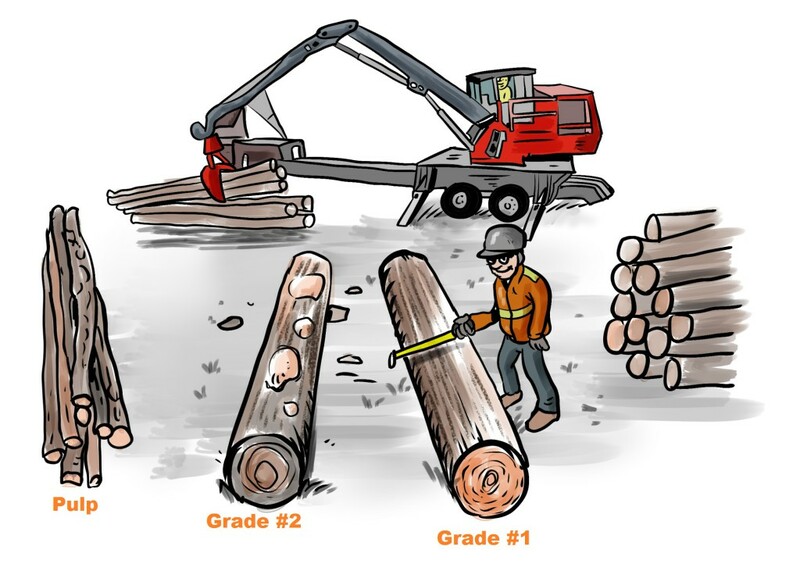 Grade 1 or #1– is a perfectly straight log that has no defects or signs of a branch originating from it at any point. It must be at least 12 inches in diameter on the small end and have no stains running through the grain. Sound easy right? It is not. When we say no defects, we mean absolutely no defects. One little tiny lump or scar will downgrade it to #2. Grade 2 or #2– is a straight log that can have a couple small scars on 1 side. Sometimes you can get away with 2 sides if the grader is in a good mood. Small limbs means less than 2 inches in diameter. If you have multiple areas where limbs have been removed it will be downgraded to pulpwood. Pulpwood- Is the lowest grade of wood possible. It can have a moderate amount of sweep or crook in the log. It can have an unlimited amount of scar tissue or limbs cut off. The only restrictions are on size. Most mills will not take pulpwood that exceeds 24 inches in diameter. Grade #1 and Grade #2 both go to the lumber mills from the wood yard. Once there they are milled and turned into lumber. Some of the logs will become dimensional lumber such as 2×4’s, 6×6’s and sized boards. Others will become lumber for fine wood products such as furniture and molding. The higher the grade, the nicer the finished product. Pulp wood will be taken to chip mills. Once there they will be put into a giant wood chipper and turned into wood chips. Those wood chips are then taken paper mills or plywood factories. The plywood factories will turn the chips into particle board. The type of particle board that is used to build hoses and other structures. The paper mills will make various paper products. Everything from cardboard to toilet tissue. With all of that being said, we can give you an idea of what we are paid for the logs. The average price per ton from wood yards are as follows. Special prices are given on Cedar and Black Walnut sometimes. So how does that translate to a per tree value. That is the tricky part, because every tree is different. Two similar sized pine trees located next to each other can be significantly different. To Simplify things we have averaged our price per ton for all wood sold over the past 5 years to local wood yards. That average is $13 per ton. The average Pine tree weighs 3-4 tons. That is an average value of $45.50. In most cases the transportation costs exceed the value of the tree. If you are still curious what the value of your trees are simply count the number of loads that we haul away from your site. Our log trucks carry 5-6 tons per trip. We occasionally receive calls inquiring if we would be willing to remove a tree in trade for the lumber. This is a valid question that is worth asking, and we know where it originates from. It is true that logging and timber procurement companies pay land owners for trees. But this is on a large scale. Usually 15 acres of clear cutting or more is required to be paid for your trees. This is called stumpage. Logging companies are able to pay for the timber due to the quantity and felling process. Large tracts of land are clear cut with large production based machines. Opposed to individual tree removal operations by tree services that require skilled climbers to work around structures and other valuable objects. At no time have we ever or will we ever pay an individual for their trees. The value of the timber is factored in to the estimate that is received for services. We are one of few local tree services authorized to sell directly to the mills. We have worked hard to obtain certifications that are required by paper and lumber mills in the Carolinas and Virginia. Different mills make different products. Some specialize in making railroad ties and some make dimensional lumber for export to Europe and Asia while others process chips to make paper. Whatever the product, we are happy to supply them with logs. Mills pay up to three times what a local wood yard pays for the same log. When we have larger jobs that contain a great number of the same species, size and grade of tree, we will bring our larger logging trucks and transport logs directly to the mill. However, when taking logs to the mill you must have all of your ducks in a row. Unlike a wood yard, most mills will only take one species of log and it must be a specific grade and length. If the wrong grade, length, size or species is taken a penalty will be imposed. If a job has three different species of trees, you can be sure that you will have at least 9 different types of logs. That means we would have to travel to multiple mills with partial loads to get rid of the logs. This creates logistic problems for production tree services like us and severely diminishes our production rate. So it is not feasible to sell directly to the mill every day. 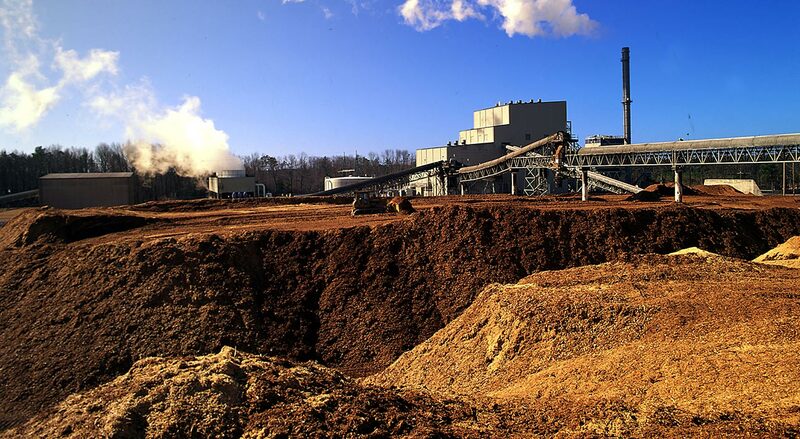 The recent green power movement has created many opportunities for the disposal of woodchips. Power plants have recently been up-fitted to use biomass as a source of alternative energy. These plants take the woodchips that we generate and use them for fuel to generate electricity. It is safe to assume that you have seen a lightbulb powered by a tree that we removed. How awesome is that? This has to be our favorite thing to do with undesirable wood. Most of us at Arbormax love to turn and carve wood. If you catch us in a daydream staring at one of your trees like it is a gorgeous woman, chances are we’re thinking about turning a bowl out of it. Criteria for selecting the best suitable wood for turning is the exact opposite of selecting grade logs for lumber. When picking a piece to turn, you actually look for the ugliest, most deformed piece possible. This will create a unique piece with character and beauty. We do not sell any of our pieces. Every piece is given away. We think if we start getting paid it will become work and we would like to keep it a hobby and a passion. We split quite a bit of firewood. Most of what we split is donated to a local charity Warmth for Wake. It is an awesome program that uses volunteers to cut, split and deliver firewood to elderly and financially challenged people. Please see our blog page to learn how you can become a part. We also get a few calls each year looking for decaying wood to grow mushrooms on. We do have a small sawmill that we use to cut special orders on. If you find yourself needing any type of wood for any reason give us a call.